In my younger days traveling around the U.K. for fun, I relied heavily on the Young Persons Railcard (now called the 16-25 Railcard) to get the best train fares. Fast forward quite a few years and I’m scoping out rail travel for our upcoming trip and holy bejeezus is it expensive to take the train! Our last trip out, we opted for renting a car (which believe me, is NO big discount considering the cost of gasoline in the U.K. but it certainly fared better than the cost for our family of four). It made sense at the time and we had a LOT of luggage. But this trip, we’ve bought our Family & Friends Railcard, which provides 1/3 off adult fares and 60 percent off kids’ fares for a family of two adults, two children. All this for £28! There are a few restrictions – notably, you can’t travel during peak rush hour times (but why would you want to?) and it’s always advisable to book tickets in advance in case seats get sold out. I’m looking forward to seeing the U.K. by train – it will certainly bring back a lot of great memories! Beautiful patchwork countryside, perfect little villages and when that gets dull, I’ve heard that some of the new trains even have individual TVs on the back of each seat! All aboard! 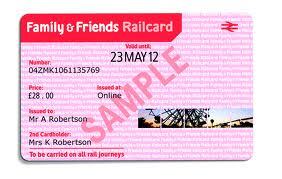 Posted on 19, March 2013, in Travel and tagged 16-25 Railcard, British, Family and Friends Railcard, train, travel. Bookmark the permalink. 4 Comments. I often use thetrainline.com for booking train travel. Sometimes you can advance book first class cheaper than standard class. No, I don’t get it either. Good to know! Will check it out – thanks!